Smacksy Saturday Photo: The Nerve Center - . 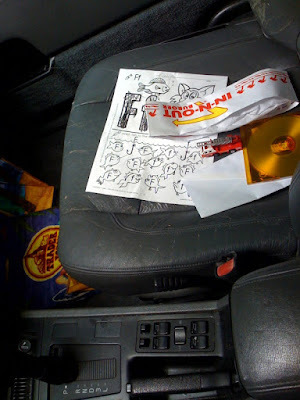 The station wagon passenger seat - also known as - my office. Now I'll be thinking about IN-N-OUT all day. I have an actual office but my passenger seat is my office adjacent although I have to move the pile once in a while to allow another adult to ride along. if you saw the inside of my car you wouldn't want to be my friend anymore. at the very least you wouldn't want me to give you a ride anywhere.